Glass wool adopts the most advanced centrifugation technique to fiber glass fibrosis, which is made of quartz sand , borax and other raw materials after 1400 ℃ high temperature melting. And then a certain amount of binder is added. Finally, it needs consolidation curing process. Such products has large amount and very thin glass fiber inside. Its total surface area is very large also, so as to strengthen the resistance of the air, making the air unable to flow and eliminating the air convection heat transfer; Similarly, huge friction decays vibration of the sound propagation carriers - air quickly, which ensures glass wool's good thermal insulation and sound absorption effect. It is also good material for sound absorption and noise reduction in steel structure building. 1. 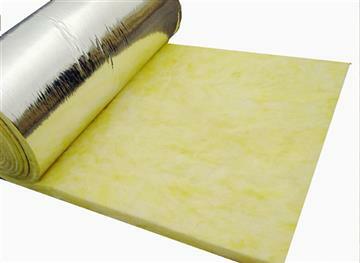 Good heat insulation performance under high or low temperature conditions. 2. No burning and produce of harmful gases, identified as "statutory non-combustible material" by countries. 3. Uniform elastic restoring force. 4. Low, intermediate and high frequency sound absorption performance, good noise reduction effect. 5. Small moisture absorption rate in wet or humid conditions. 6. Small linear expansion coefficient. 7. Aging rate is low. It can maintain original performance after long-term use. The following data is thickness comparison of glass wool felt 12kg/m3-50mm with various same heat insulation effect construction materials. Above data can prove that glass wool far more better thermal insulation performance than other materials. Steel structure with glass cotton JHY - M10.